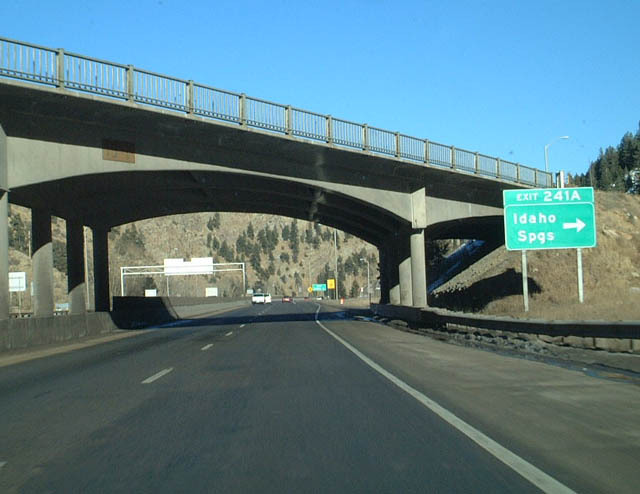 The 1960-built overpass for Colorado Boulevard and former loop ramp (Exit 241A) for Business Loop I-70 leading back into Idaho Springs. 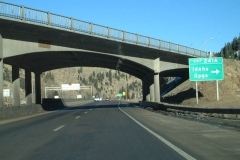 A new bridge replaced this span in 2015. 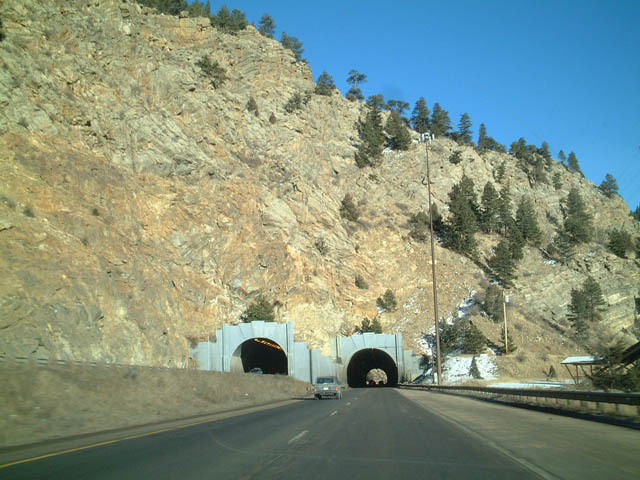 Photo taken 02/02/02. 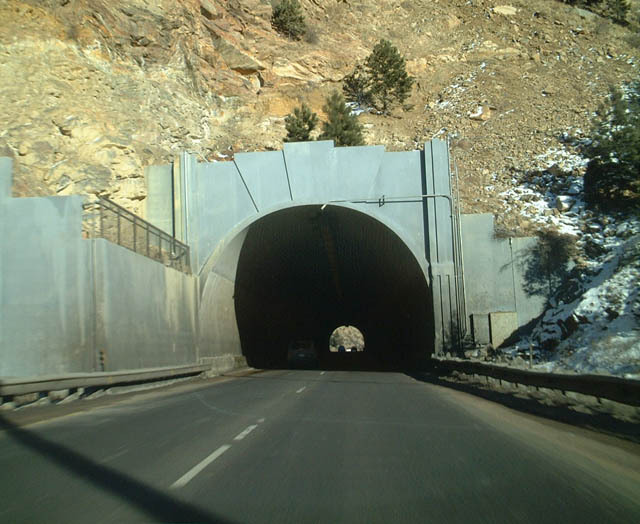 Historical views of the Twin Tunnels along Interstate 70 east. 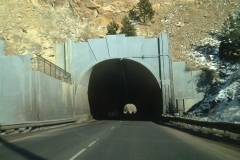 The original pair of two lane tunnels were completed in 1961. 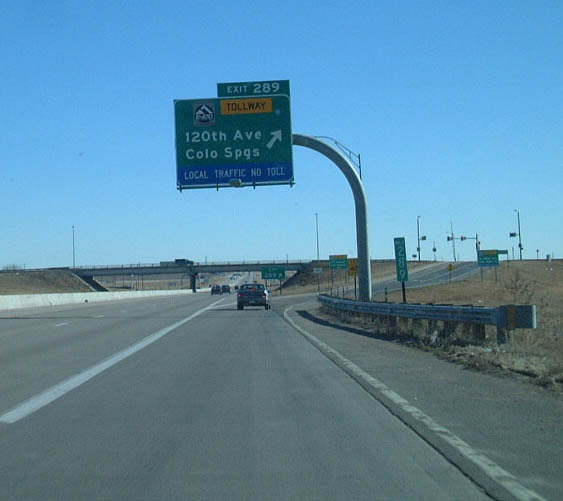 Photo taken 02/02/02. 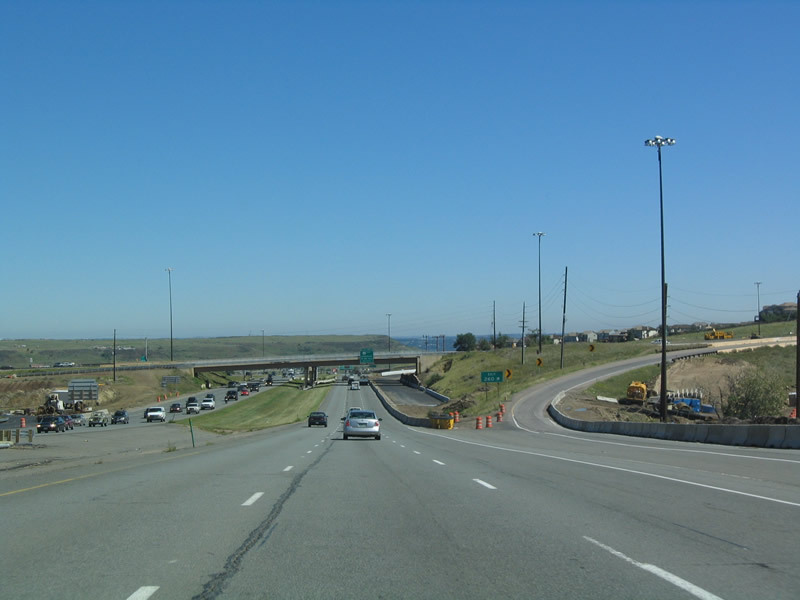 The separation of U.S. 6 east from Interstate 70 at Exit 244 prior to work to expand the freeway to six lanes. 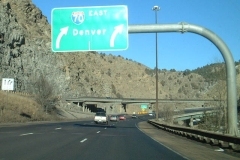 Photo taken 02/02/02. 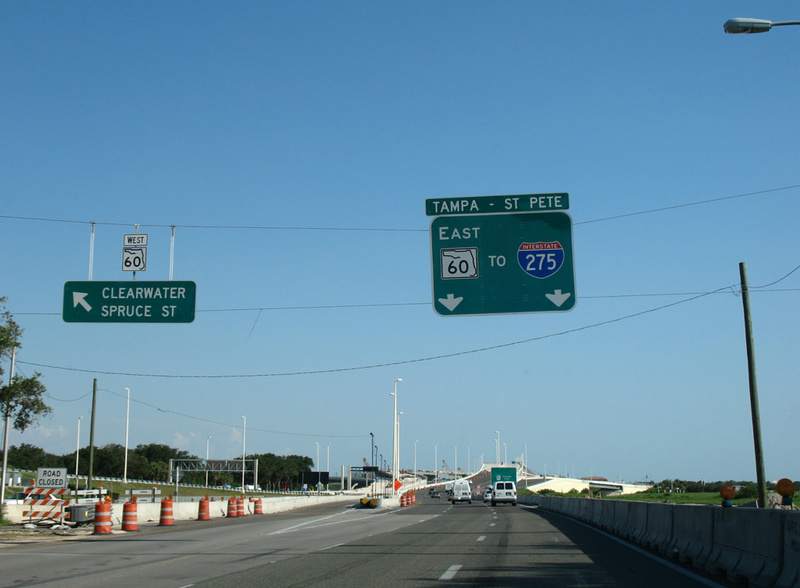 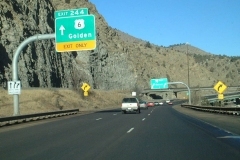 Replaced guide signs at Exit 259, reflecting the recent decommission at the time for SH 26 to Morrison. 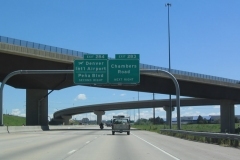 Photo taken 08/28/04. 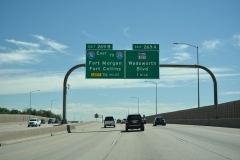 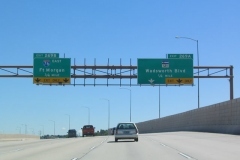 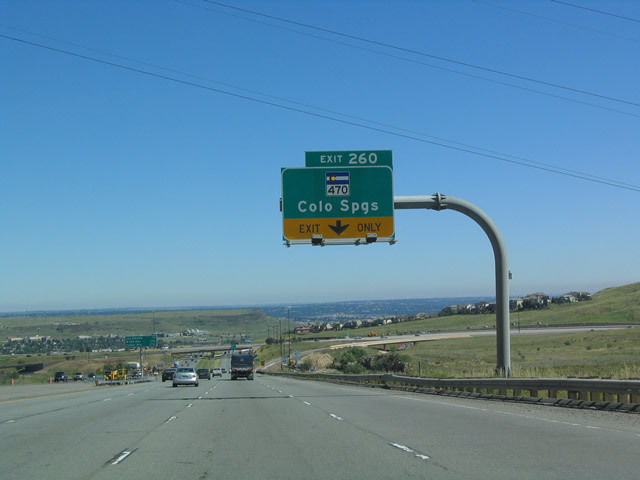 Prior to 2006, Exit 260 provided access to C-470 south only from Interstate 70 east. A new loop ramp opened then with the C-470 spur to U.S. 6 in Golden. 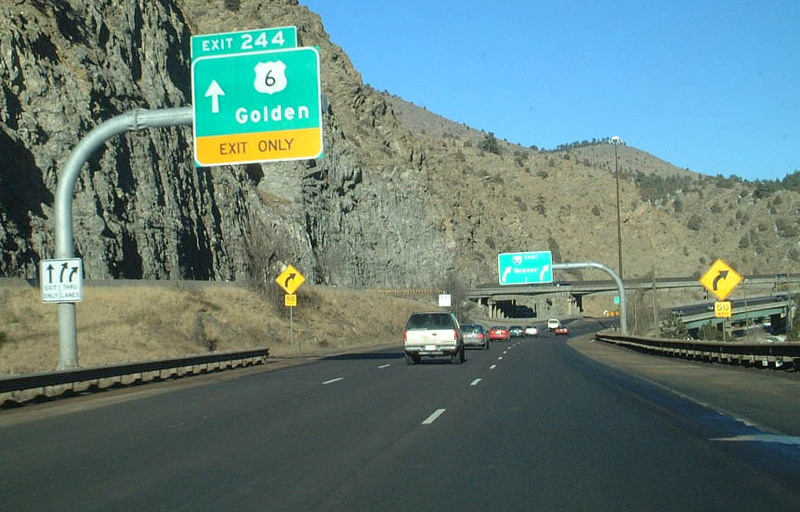 Photo taken 08/28/04. 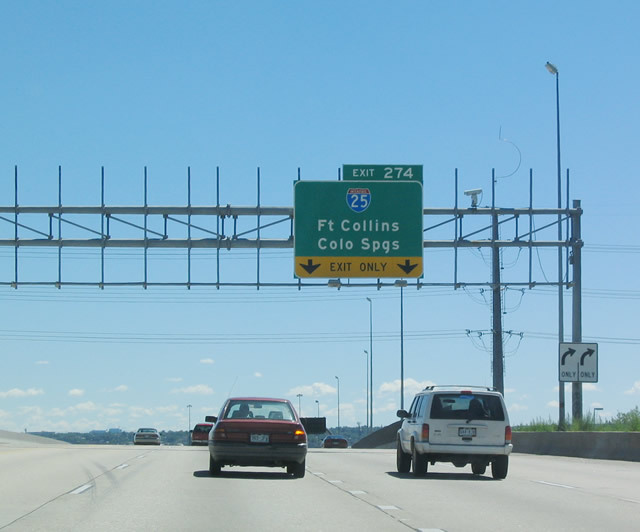 Construction underway at this time added the c/d roadway system for C-470 south to Colorado Springs and north to Golden. 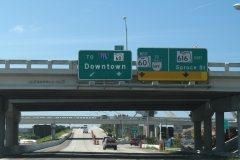 Photo taken 08/28/04. 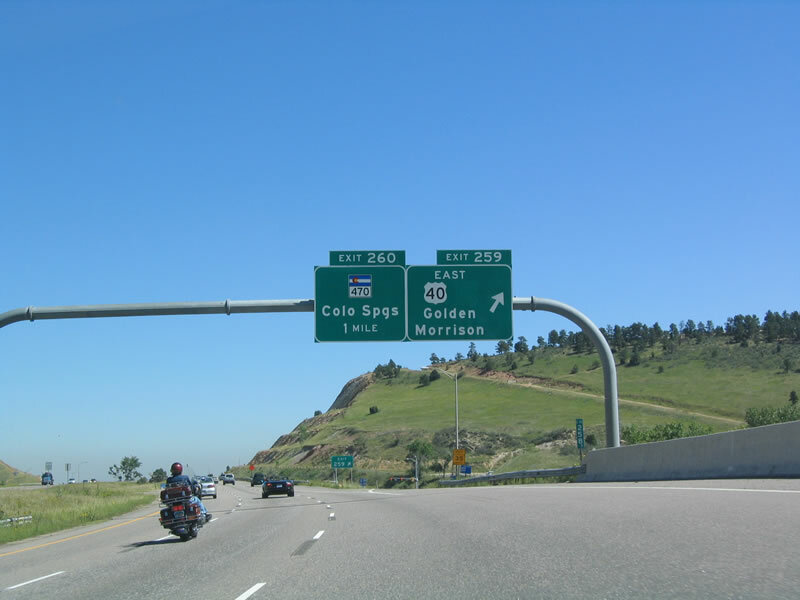 Interstate 70 and U.S. 6 cross paths again in southeast Golden at Exit 261. 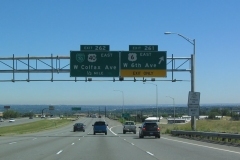 An older style shield for Business Loop I-70 at Colfax Avenue appeared on this set of replaced signs. Photo taken 08/28/04. 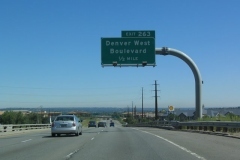 Originally signed as Denver West Boulevard, signs for Exit 263 were amended to drop Boulevard and add Colorado Mills Parkway. 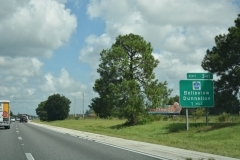 Photo taken 08/28/04. 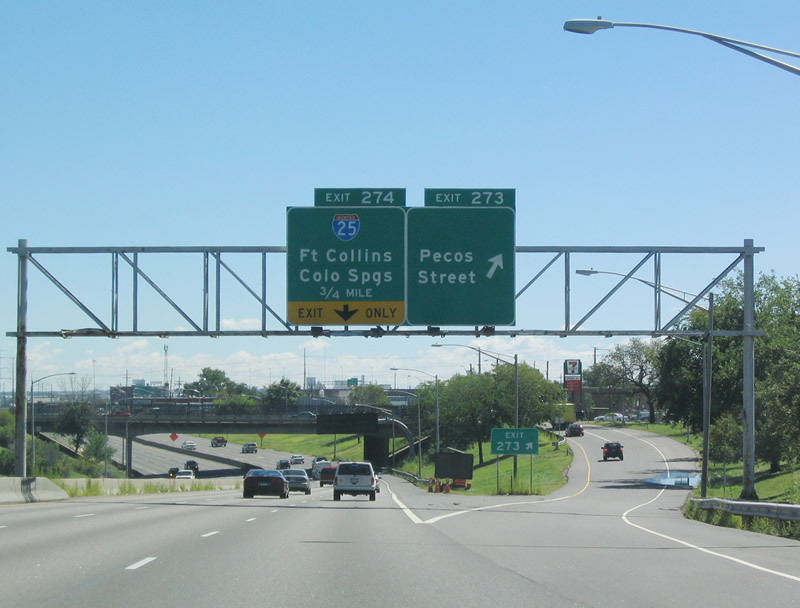 Heading north from 32nd Street, I-70 previously met SH 58 with no access to the freeway westbound. 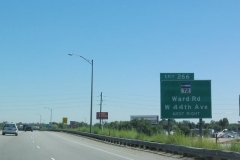 Instead motorists continued to SH 72 at Ward Road. 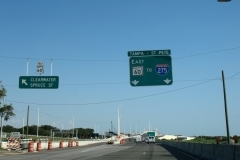 Photo taken 08/28/04. 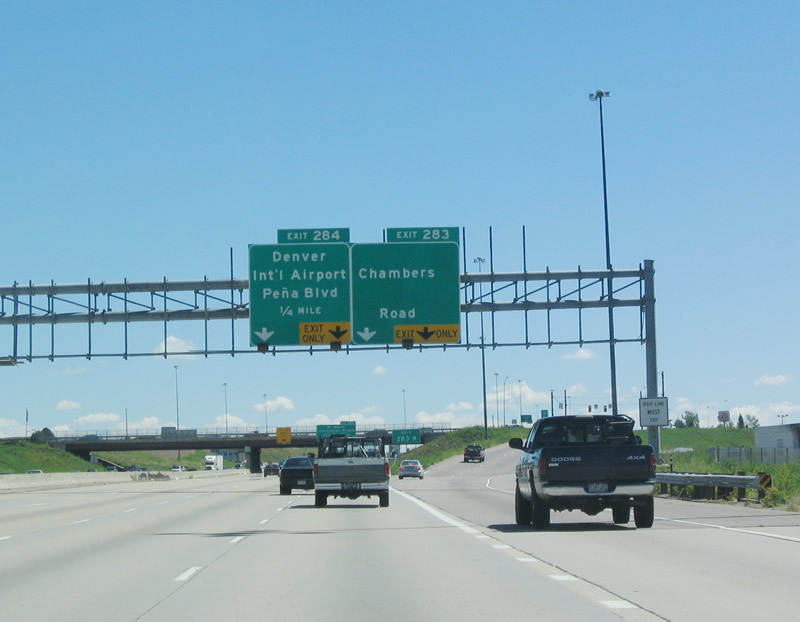 The end of Colorado 58 was previously signed with this assembly placed ahead of the merge with Interstate 70 east. 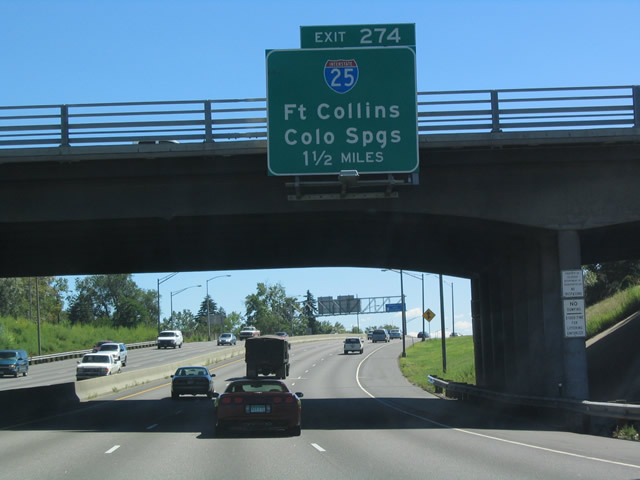 Photo taken 08/28/04. 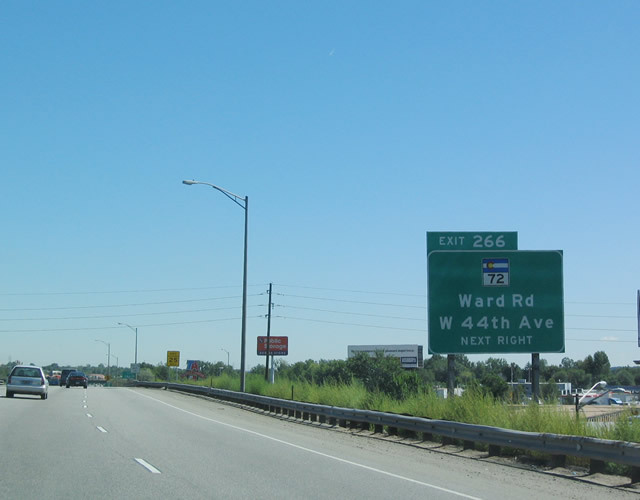 Ramps linking the eastbound lanes of I-70 from 44th Avenue at Exit 266 were relocated eastward after 2009. 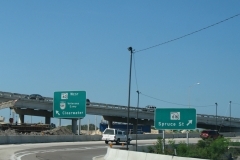 Photo taken 08/28/04. 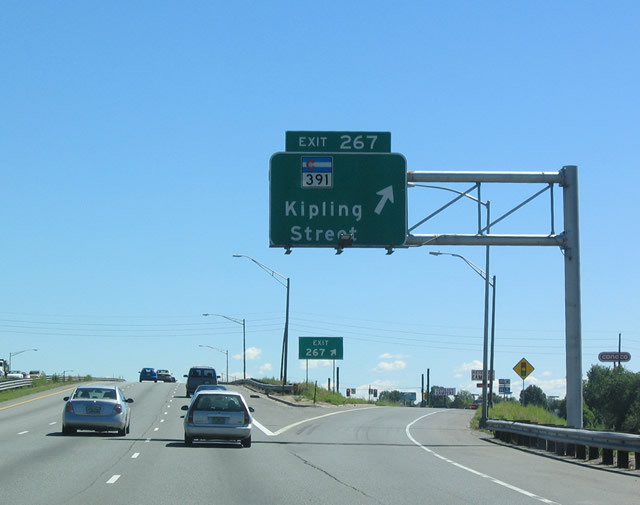 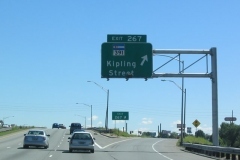 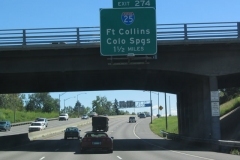 A rounded edge sign directed motorists to Colorado 319 (Kipling Street) from Interstate 70 east at Exit 267. 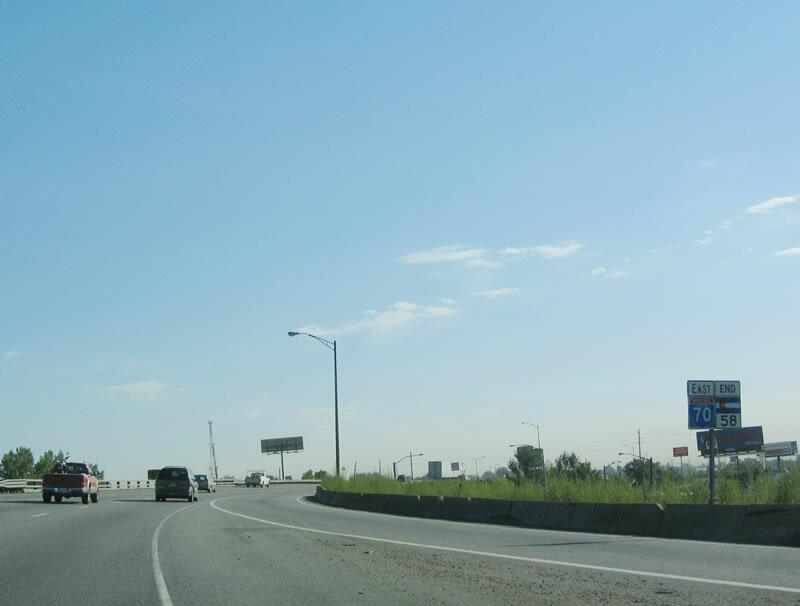 Photo taken 08/28/04. 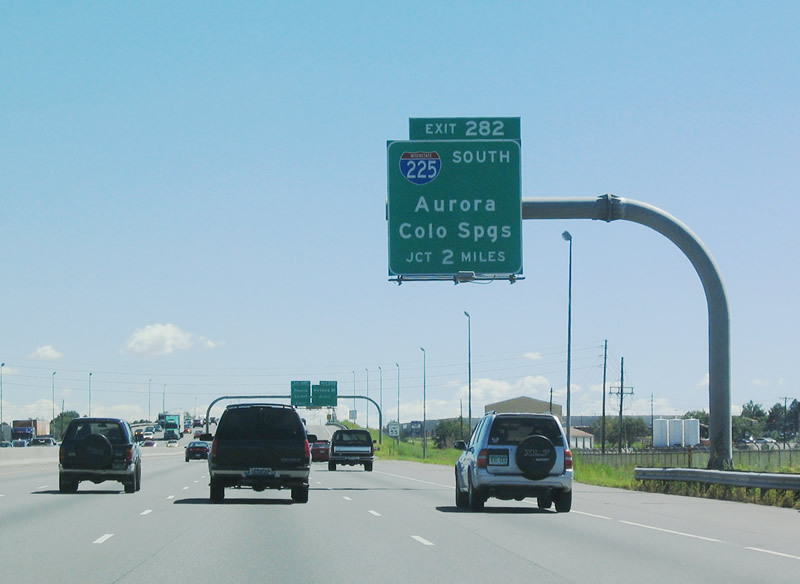 The lone overhead formally referencing the I-76 connection with Interstate 25 north for Exit 269B was replaced by April 2017. 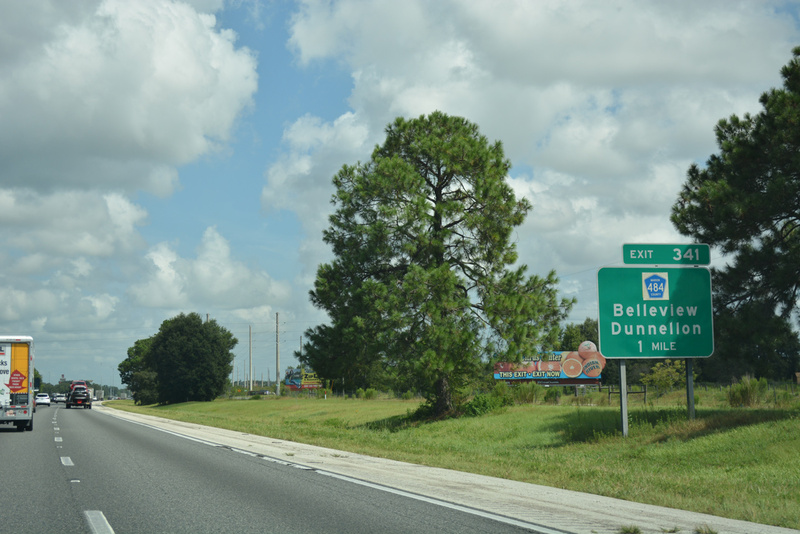 Photo taken 08/11/16. 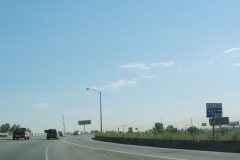 Guide signs for the Exit 269B partition of Interstate 76 east from I-70 east were carbon copied by 2011. 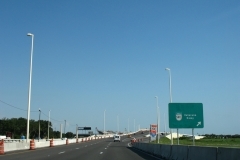 The new signs are no longer illuminated. 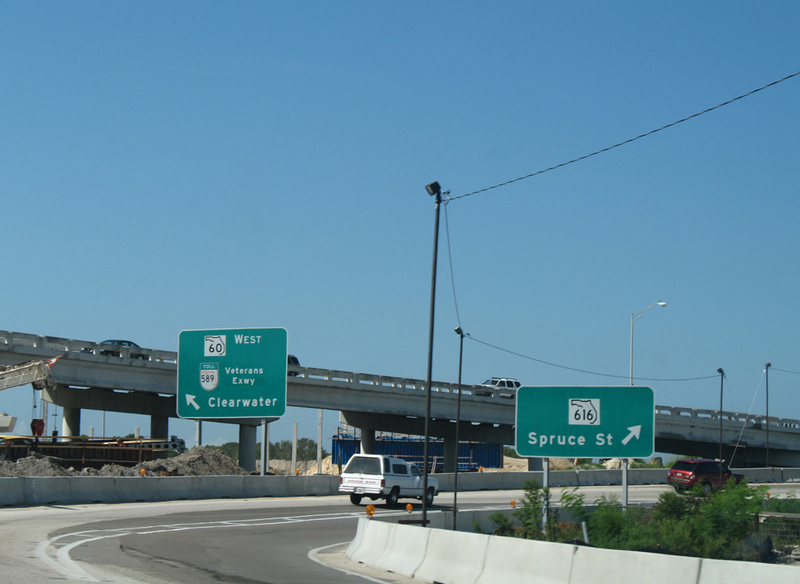 Photo taken 08/28/04. 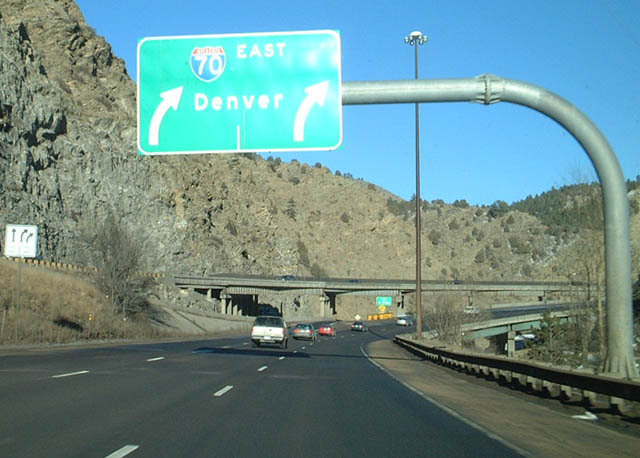 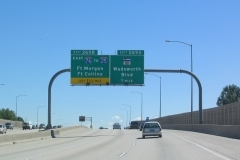 Subsequent signs for Interstate 76 omit the connection with I-25 north. Left exit tabs were not incorporated in the sign replacements. 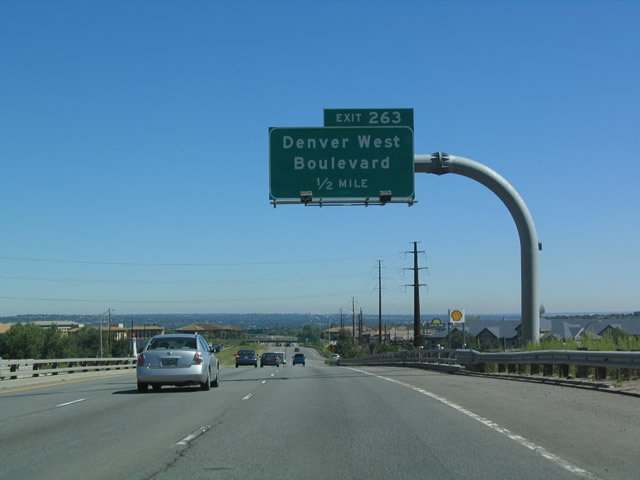 Photo taken 08/28/04. 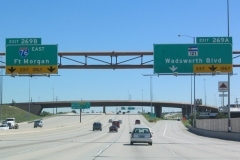 The western Interstate 76 begins in a wedge of the Arvada city limits, and leads in a northeasterly direction to connect to Interstate 80 near Big Spring, Nebraska. 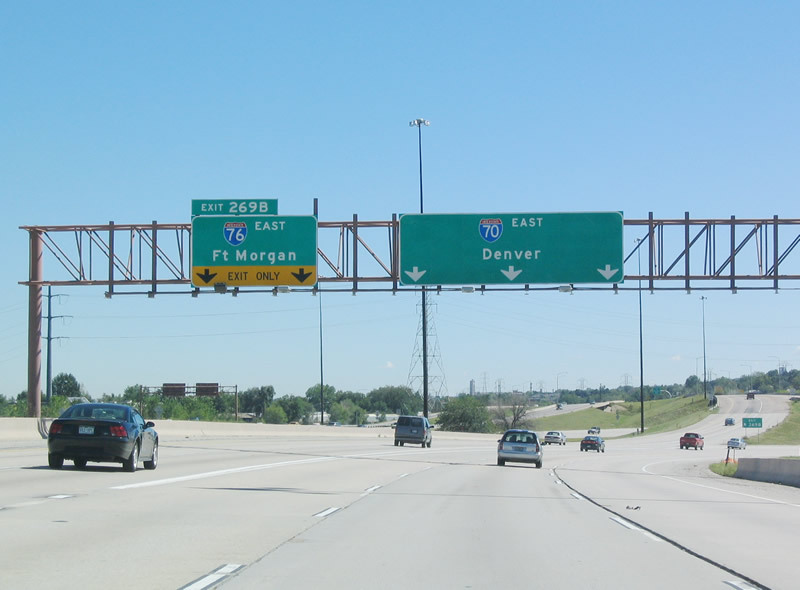 Within Colorado, Interstate 76 parallels the South Platte River, leading to the Eastern Colorado towns of Fort Morgan, Sterling, and Julesburg. 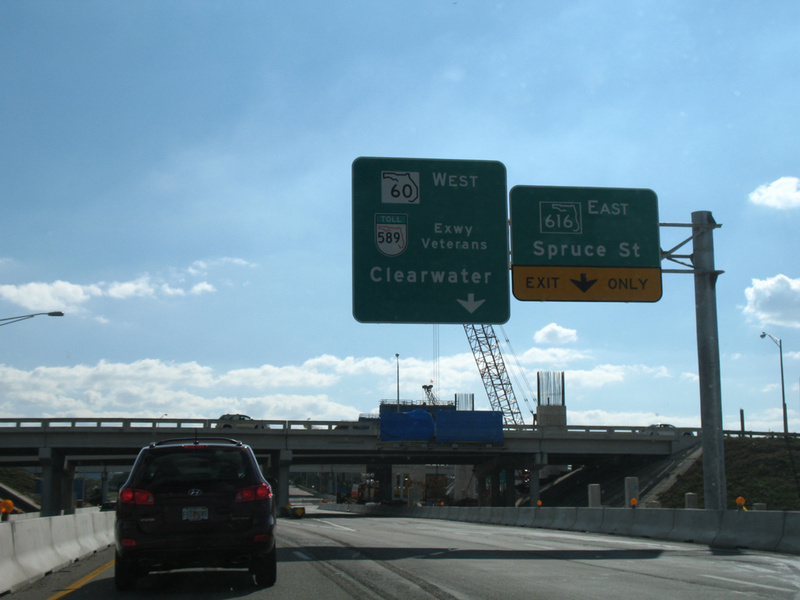 Photo taken 08/28/04. 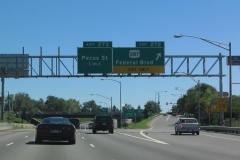 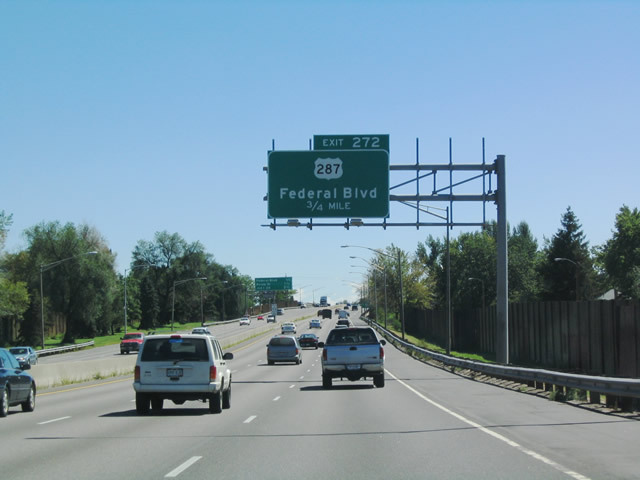 This advance sign for U.S. 287 (Federal Boulevard) was carbon copied by 2011. 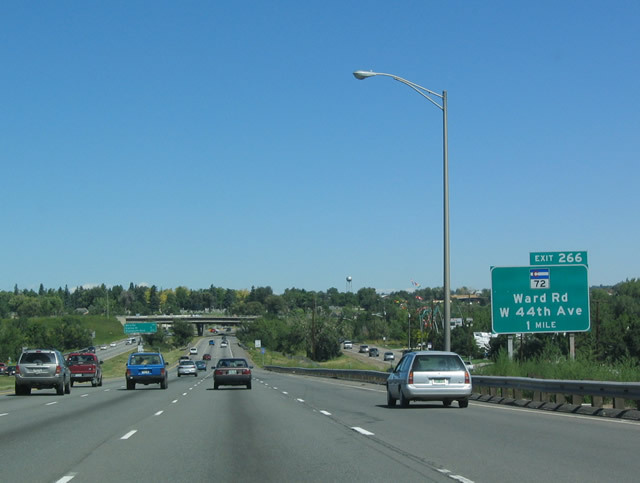 Photo taken 08/28/04. 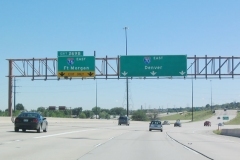 A side mounted monotube assembly replaced this full sign bridge at the diamond interchange (Exit 272) with U.S. 287 on Interstate 70 east. 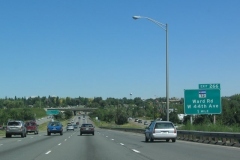 Photo taken 08/28/04. These signs were replaced with separate panels on new monotubes by April 2017. 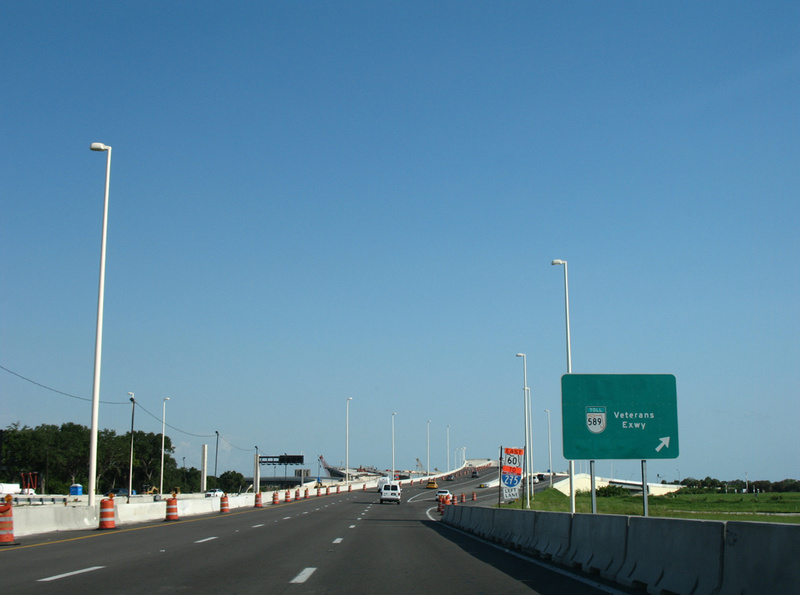 Photo taken 08/28/04. 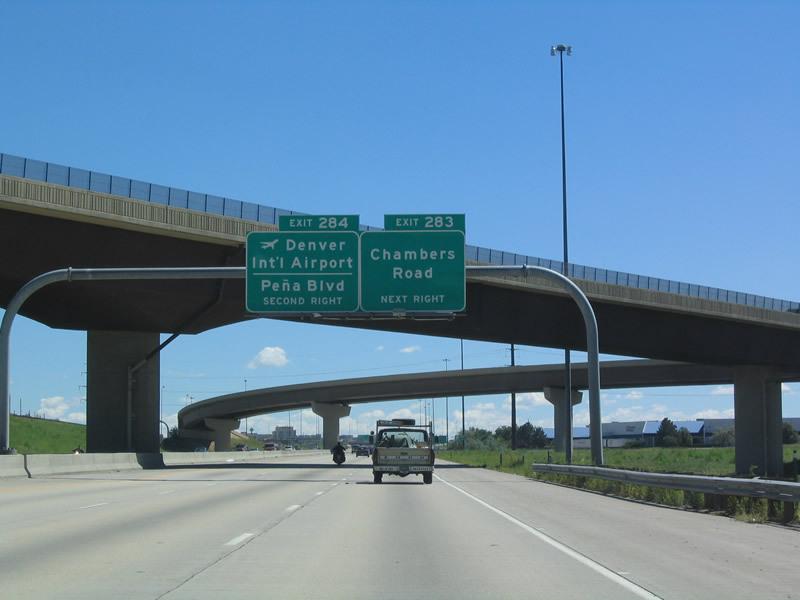 The Pecos Street overpass, 1.25 miles west of I-25, was replaced during construction in 2012-13. 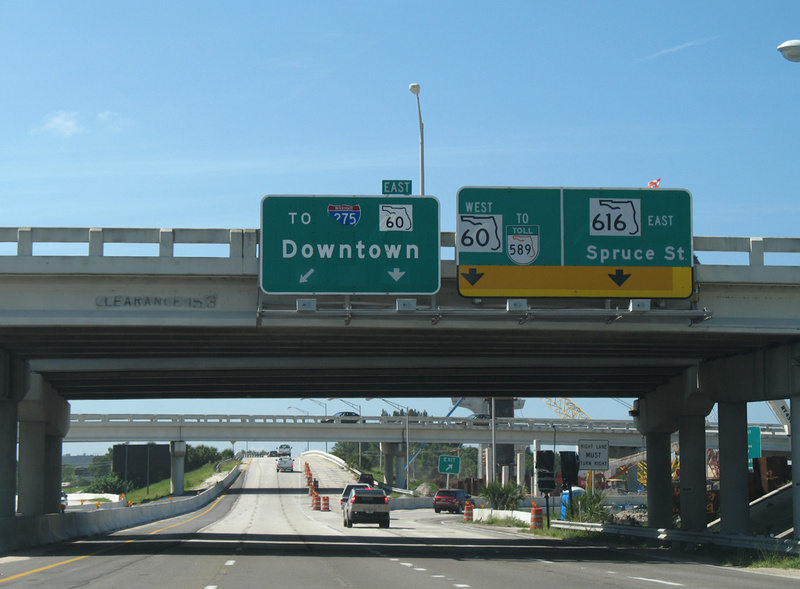 Photo taken 08/28/04. 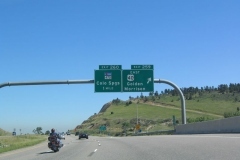 Replaced guide sign and removed lighting fixtures for the two-lane off-ramp (Exit 274) from I-70 east to Interstate 25 at the Mousetrap Interchange. 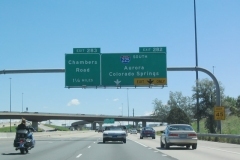 Photo taken 08/28/04. 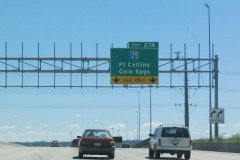 Former guide sign posted two miles out from the systems interchange with I-225 south on I-70 east. 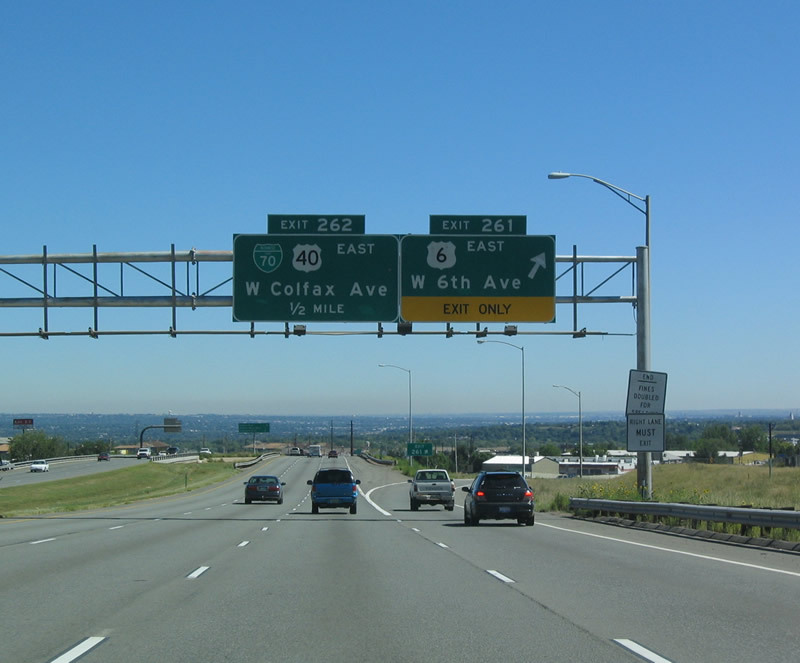 Photo taken 08/28/04. 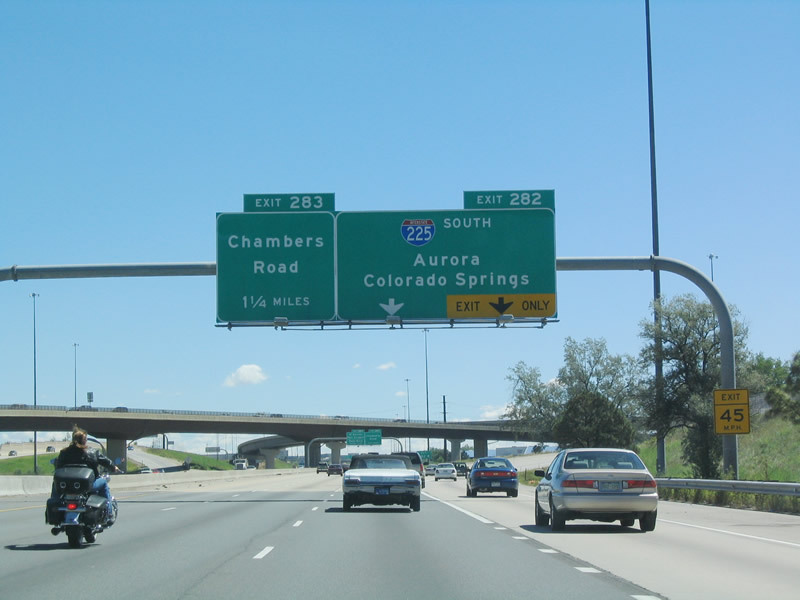 The advance sign for Chambers Road was removed when a new three-lane sign for I-225 south was added at Exit 282 by 2015. 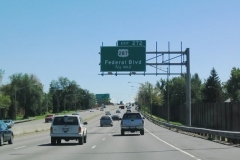 Photo taken 08/28/04. 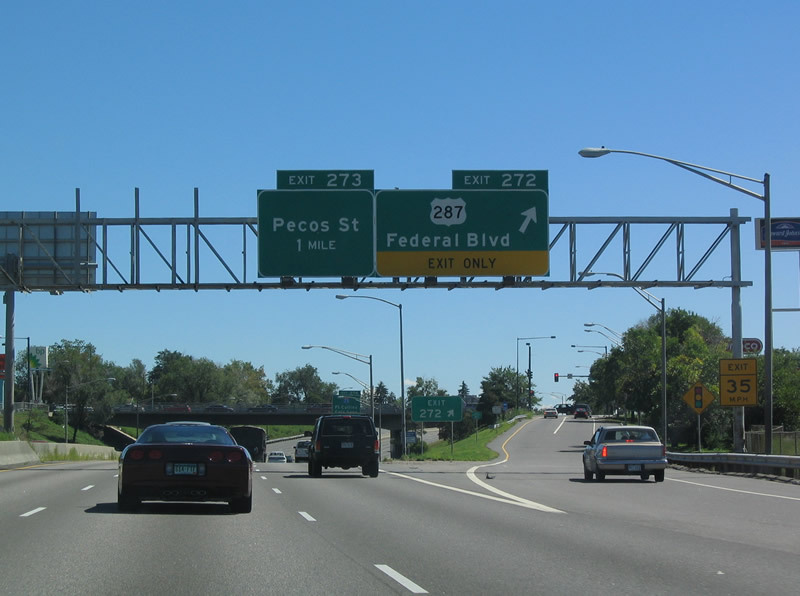 Older panels for Exits 283 (Chambers Road) and 284 (Pena Boulevard) referenced next right and second right. 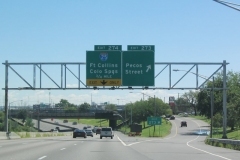 New signs installed by 2008 changed this to one and 1.25 miles respectively. 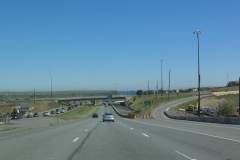 Photo taken 08/28/04. 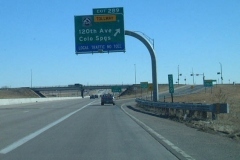 A pull through panel for I-70 to Limon was added during replacements of these overheads at Chambers Road (Exit 283). 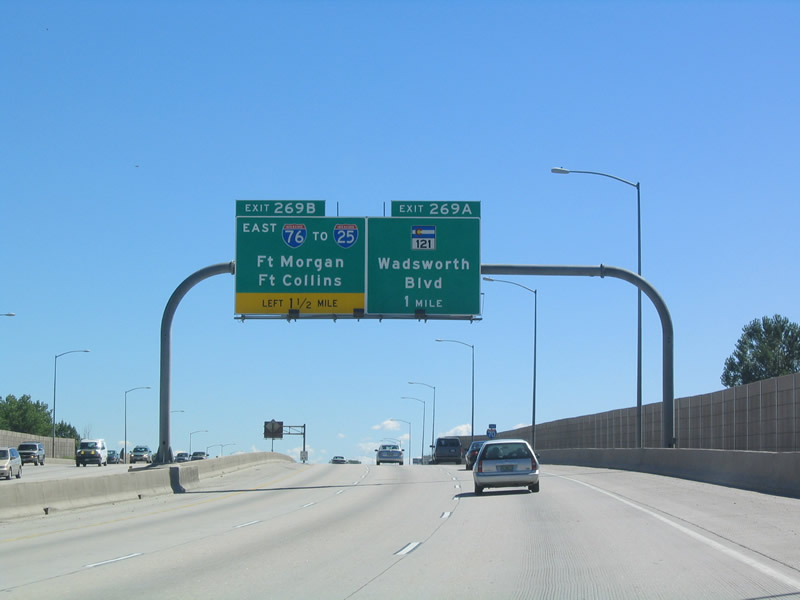 Photo taken 08/28/04. 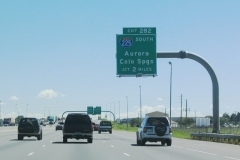 Prior to 2006, E-470 downgraded to use Gun Club Road to meet Interstate 70 at a diamond interchange (Exit 289) in rural east Aurora. 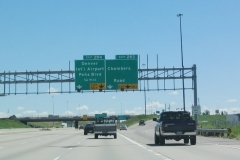 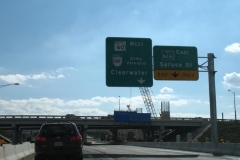 This required motorists to navigate through four traffic lights at the frontage roads and ramps for Interstate 70. 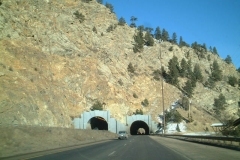 Photo taken 02/02/02.